Eltronicschool. - This is one of circuit schematic DC to DC converter based on Silicone Controlled Rectifier (SCR). In here SCR used to convert input voltage with other value in output. In this time, we will give you Circuit Schematic SCR DC to DC Converter Circuit using S6008 SCR like in Figure 1. below. Circuit schematic like in Figure 1 above is Circuit Schematic SCR DC to DC Converter Circuit using S6008 SCR. 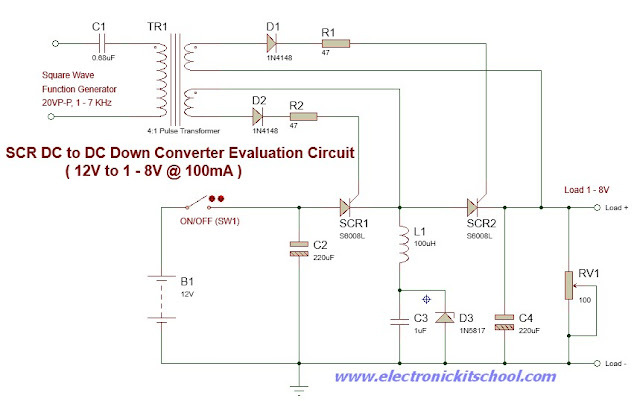 According ElectronicKitSchool blog describe that 12V to 1 - 8 Volt, 100mA SCR DC to DC Converter Circuit using S6008 SCR. The main component used in this circuit is SCR served as the DC to DC Converter. For more information about Circuit Schematic SCR DC to DC Converter Circuit using S6008 SCR, please read more from original source using link here.